Bo Derek is a film and television actress, film producer, and model perhaps best known for her breakthrough role in the film “10”. She is also a spokesperson for the Animal Welfare Institute’s campaign to end horse slaughter through legislation, was a Special Envoy of the Secretary of State for Wildlife Trafficking, and travels the globe on behalf of the Coalition Against Wildlife Trafficking. Bo served as a commissioner of the California Horse Racing Board between 2008 and 2015, and in that role helped to enhance safety and animal rights in the Thoroughbred industry. 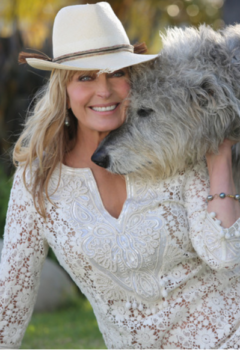 She published her autobiography Riding Lessons: Everything That Matters in Life I Learned from Horses in 2002 and recently launched “Bo Derek Pet Care,” a line of shampoos and conditioners for dogs. Bo shares her home with her dogs, Chico, Smokey, and Luc who bring her much joy, love, and laughter each day.